It is finally that time of year. Mums and pumpkins are everywhere, and I have been in my kitchen so much cooking and baking up tasty treats! One of my favorite snacks is roasted pumpkin seeds. When it’s time to carve pumpkins, I get excited not only to decorate our porch with pumpkins but also because I love roasting and eating the seeds. Last year, I tried a new recipe and we’re still using the same one! I figured it’s definitely time to share it, since we’re so close to Halloween and practically everyone is buying up pumpkins right now. After removing the seeds from the pumpkin, rinse and pat them dry. Place them in a bowl. Add the oil and honey to the bowl and stir until well combined. I usually use my hands for this part. 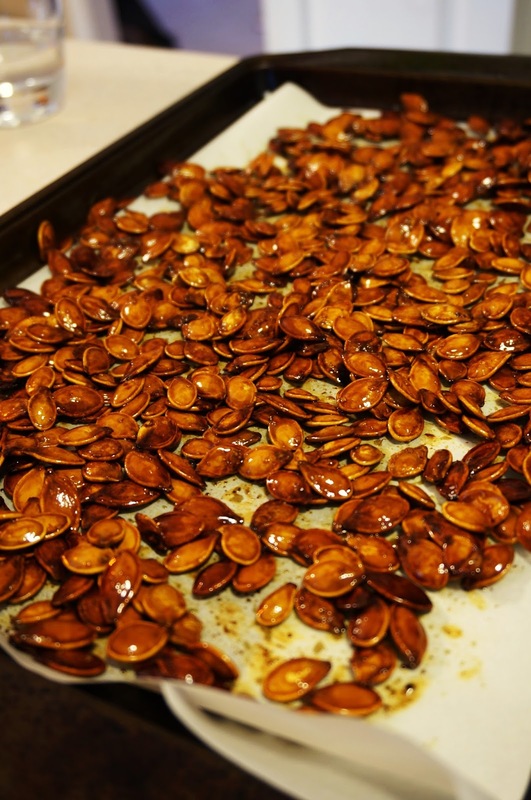 Spread the pumpkin seed/oil/honey mixture out on a parchment-lined baking sheet. Roast the pumpkin seeds for about 20-30 minutes. Try one to see if they’re done. You want them to crunchy, not soft. You can roast them longer if you need to and check them every 5 minutes. When they’re done, let them cool before you start snacking. They are a very tasty treat anytime you need a small snack. Enjoy!